Even with continued strength in the reverse mortgage backed securities market, stubbornly high levels of prepayments have driven the overall market to shrink, according to two new reports from New View Advisors. The New York City-based financial services firm cited data showing that the Home Equity Conversion Mortgage-Backed Securities (HMBS) market is on track to match last year’s total of about $9.2 billion, with $2.3 billion in issuance during the first quarter of 2017. “Despite the much-reported slowdown in HECM endorsements, HMBS issuance remains robust, aided by growth in tail issuance and without highly seasoned pools,” New View noted in its analysis. “Tail issuance” refers to HMBS pools created from the uncertificated portions of HECMs that have already been issued. Still, in a separate report, New View covered persistently high HMBS payoffs, which exceeded new issuance for the seventh month in a row in March — $966 million in payoffs against $727 million in new securities. Based on New View’s estimates, the overall outstanding HMBS market contracted by $62 million from February. 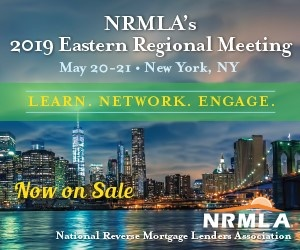 As New View partner Michael McCully told RMD back in February, the spike in prepayments has come as a significant quantity of fixed-rate loans from 2009 to 2011 have matured and seen reassignment to HUD, likening the effect to a snake eating a rabbit — with the caution that the payoffs will likely “normalize” after more loans from this period reach 98% of their value. Industry giant American Advisors Group topped New View’s list of top HMBS issuers during the first quarter of 2017, with a total of 57 pools valued at $538 million — good for a market share of 23.3%. Finance of America Reverse took a distant second with $388 million in issuance, followed by Reverse Mortgage Funding, Ocwen Loan Servicing, and Nationstar Mortgage. These top five HMBS issuers represented 79.6% of the total market, according to New View, with no new players entering the market since last quarter.